West Bengal chief minister Mamata Banerjee. File photo. The West Bengal government just got ₹ 8,750 crore from the central government (read: the Indian taxpayers) to buy time as the state ostensibly tries to fix the enormous hole on its balance sheet. There were no strings attached to this bailout from the Union finance minister Pranab Mukherjee. 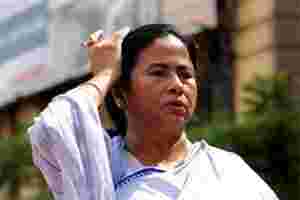 West Bengal did not have to commit spending cuts, and there were no strict admonitions to the state urging it to live within its means. In a different context, the honourable finance minister said recently that just because the economy is doing relatively unwell as of now does not mean that Indians should be expected to eat lizards. Moreover, the primary revenue deficit has still not been controlled. In other words, even if the debt and interest payments were somehow magically waived off, Bengal would still run a deficit. The latest revised estimate including interest payments of the fiscal deficit (as opposed to Panglossian budget estimates) is 6.7% of the state GDP for 2009-10. A full sixteenth of the local economy is consumed in just funding the difference between the government’s expenditures and revenue. The other states don’t have stellar fiscal records either, but Bengal has consistently ranked as one of the worst states by this metric. Meanwhile, Reserve Bank of India (RBI) governor D Subbarao suggested that no state would be given any special concessions from the monetary authority through the means and ways advances (MWA) facility. It will be interesting to see how long such Trichean fortitude lasts. Another technocrat, a former RBI governor, recently supported foreign direct investment in retail, allegedly staking his political and personal credibility on the move. Then, suddenly in just a few days, he decided to “suspend" the move. His name, of course, is Dr Manmohan Singh. But why complain about fiscal centralization? Should we not be relieved that India, like the United States, has long had the fiscal union and a somewhat centralized welfare state - a model that the European Union so desperately seeks to emulate right now? We do not have too worry about a weak centre in India, but - and this is never stressed enough - India does not have the competitive federalism and the fiscal discipline at the state level that the US has cultivated. India’s states can always turn to Delhi for some fiscal support without the legally-mandated fiscal responsibility that state and local American governments have. The US has profligate states too. But a California is not a Bengal or a Greece in certain important ways. The Federal Reserve does not buy state debt. Therefore, any bailout must have the imprimatur of elected representatives in Washington DC. This construct is unlike that in the EU (where the European Central Bank which has been buying Greek and Italian debt), and similar to that in India. Moreover, US president Obama can’t easily write a cheque to an American state, whereas the central government just wrote one to Bengal. This has been the norm in India, with the result that states governed by parties that are in the Opposition at the centre routinely complain of the discrimination that such discretion can beget. Most American states also have strict limits on their spending, taxes and deficits - with many states having amendments mandating the balancing of their budgets. This forces them to fire redundant government employees to stay solvent. They have freedom to fix their own tax rates and compete with other states for businesses and taxpayers. This is different from Europe, where value-added tax harmonization is being pushed through rate floors, and very unlike India where the incipient same-rate goods and services tax would further dilute fiscal federalism. The worst effects of any American downturn get ameliorated by centrally-funded stabilizers such as food stamps and unemployment insurance. Moreover, even without a centralized welfare state America has a natural advantage. Cultural homogeneity facilitates greater internal migration than Europe, allowing regional labor markets to somewhat equilibriate. In Europe, around 8% of the working age or 15-64 years old population were foreigners (European Labour Force Survey, 2009), up from 5% in 2000. But this was not enough to prevent hugely different unemployment rates. Before more southern Europeans could move to the North for job opportunities, leveraged banks and bond vigilantes brought on the crisis. India is also very diverse, but given its income levels it has managed to remain surprisingly cohesive. Educated labour is increasingly more open to changing states and cities for better pay. Therefore, we need not rely on over-centralisation to prevent the worst inequities of a downturn. We must maintain our fiscal union, but supplement it with competitive federalism and balanced budget amendments at the state level. Laws like the Fiscal Responsibility and Management Act cannot fundamentally change political incentives unless Delhi is legally obligated to say "No" to requests for bailouts, no matter which political party chief is asking for it. Rajeev Mantri is director of GPSK Investment Group and Harsh Gupta is director of Catallaxy Finance.